State law requires that, “each female inmate shall be issued sanitary napkins and/or tampons as needed.” But in the SLO County Jail, women are required to pay $3.23 for a box of 10 tampons. Attorney Paula Canny filed the lawsuit on behalf of past, present and future female inmates. She is asking the court to require Parkinson to provide all female inmates tampons and sanitary napkins as needed, to provide an accounting of all money collected for tampons and to return all monies the county charged female inmates for tampons. The county jail has repeatedly violated Title 15’s minimum requirements for state jails, according to state mandated inspection reports. While state reports detail the county’s failures, there are no regulatory penalties. If county’s refuse to follow the state’ minimum requirements for county jails, civil suits are often the only means to force compliance. In July 2017, SLO County paid a $5 million settlement to the family of a man who died after jail guards left him strapped in a chair for more than 46 hours. The county also agreed to implement changes at the jail. Canny, also the attorney for the family of 36-year-old Andrew Holland, hired a team of professionals to inspect the jail and make recommendations to help ensure that in the future inmates will not suffer because of neglect or mistreatment. I remember a friend of mine who knew Parkinson when he first ran for Sheriff, told me that Ian was not the sharpest knife in the drawer, which has really proven true!!! Would love to see the jail more family friendly, a cheaper in house commissary run by a local non profit, phone call system that doesn’t gouge the family, make it easier to make visits, instead of the new system that Parkinson has put in place! 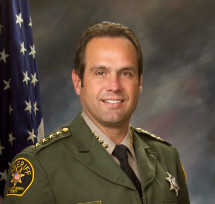 Sheriff Ian Parkinson must go, and his tenure in office has turned into a bloody mess, so he needs to be replaced. Taxpayers should remember, for instance, the $5 million dollar payout that taxpayers will fund because Parkinson allowed a mentally ill inmate to lay unattended for dos, until his body shut down. Parkinson has never provided a full accounting of this manslaughter, and leaving him in office sets a low bar for other politicians. 02/13/2013 Cal Coast News about Lisa Niesen/Family Ties with CAPSLO. In 2013, about 60 homeless people were cited for sleeping in their cars at night. They were cited UNLESS they had a “case manager” at CASPLO AND paid up to 70 percent of their income to Family Ties courtesy of Lisa Niesen, Dee Torres/Capslo. Extortion? Oh hell Yes! This reminds me of CAPSLO charging money for diapers, tampons, plastic forks and paper plates etc. at the homeless shelters. All of which was donated to CAPLSO. Oh yes and don’t forget about the gift certificates donated by vendors for the homeless. The gift certificates ended up going to CAPSLO employees. Corruption never ends in San Luis Obispo. Wasn’t it just one employee that kept and used the gift certificates, Dee Torres-Hill? Ian Parkinson has to be voted out of office. As the head of the Sheriff Department I hold him responsible for each scandal the tax payers have had to cover…Time to say GOOD BYE Ian. We need to vote in someone who has not worked in the Sheriffs department. Fresh eyes! Only if this was a line-item veto would the sheriff even know about this purchase. Let’s stop blaming the sheriff for everything!! Free housing, freemeals, free medical, free dental, free toilet paper, and now free tampons. This jail thing sounds better and better all the time. Do they get Netflix? Unfortunately, these are one thing inmates should be provided for free. It is a health and safety issue. You really don’t want women bleeding all over the place, do you? Blood is a biohazard, and menstrual blood is just extra gross. I suppose this just shows how shallow I am, but the juxtaposition of our sherrif’s noble visage and that headline strikes me as deeply funny.